KNOXVILLE — Although the gap is closing some, Tennessee still remains at the top of men's college basketball. The Volunteers remained in the No. 1 spot in both the Associated Press and the coaches' polls released Monday. They're followed by Duke, Gonzaga, Virginia and Kentucky in the top five. Last week Tennessee held a 47-point lead on Duke in the AP voting and a 45-point lead in the coaches' poll. The Blue Devils (21-2) gained eight first-place votes this week, based on a win at then-third-ranked Virginia on Saturday. Home victories against Missouri and Florida improved the Vols to 22-1 for the season, with 18 consecutive wins. Their lead in the polls was cut substantially, though, as the margin now sits at 19 points in the AP list and 30 in the coaches'. But while the margin at the top is shrinking, Tennessee has more important things to focus on in its own league. 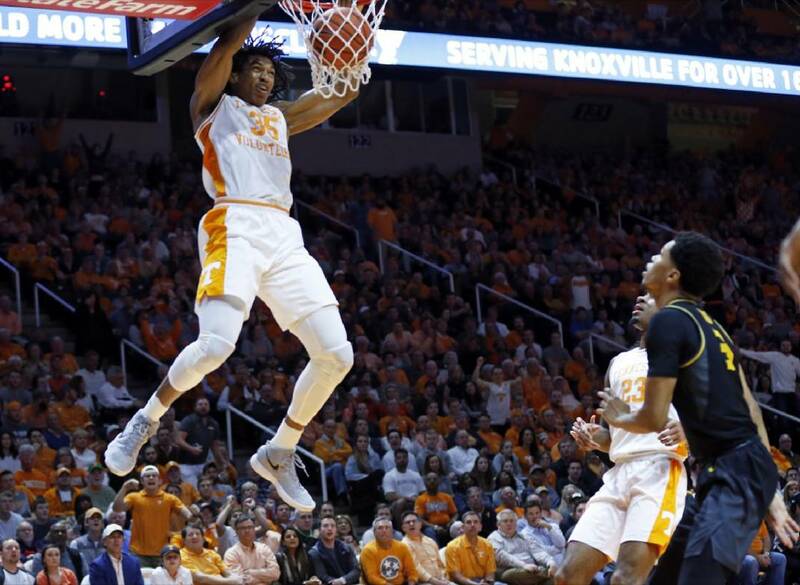 The Vols have six games remaining against teams that are projected to be in the NCAA tournament field, not counting their next game Wednesday against a South Carolina team that's currently 7-3 in Southeastern Conference play. Tennessee is 10-0 in the SEC, and after the game against the Gamecocks they have a home game against Vanderbilt sandwiched between road trips to Top 25 opponents Kentucky and LSU. Both the Wildcats and Tigers — who meet tonight at Rupp Arena — are 9-1 in the league. There are also road trips to Ole Miss and Auburn and a home game against Mississippi State — all potential tournament teams — on the horizon. "I think in terms of sorting itself out, it'll sort itself out in the next eight games," Tennessee coach Rick Barnes said Monday. "We've got to be focused on what we're doing right now. ... I just think you've got to be so locked in on your next opponent that that's what you've got to stay focused on. If you start trying to play this, that or what-if game, it just never plays out like that. "It's important from our standpoint that we know that we're on the back side of the conference, and we know that the next couple of weeks are important to all of us, regardless of where we are in the league. There are so many games. You can look at Arkansas with the four-game winning streak. It can happen that way; it can happen the other way. That's why you should look at it like, 'This is what we've got,' and if we get sidetracked from that, things can snowball if you don't stay focused on exactly what you need to do, which is focusing on your next opponent." Sophomore Yves Pons' availability for Wednesday's game is still up in the air. The 6-foot-6 Pons missed Saturday's game against Florida after suffering a facial injury in practice, and Barnes said Monday that Pons — who still has some swelling after a surgery on Friday — could play if a specially ordered mask arrives in time. "He will probably have to wear the mask for a couple of weeks," Barnes said. "He will not do any contact today. If it comes in he will definitely do it." Pons has 13 starts and has averaged 3.2 points and 2.4 rebounds a game this season.